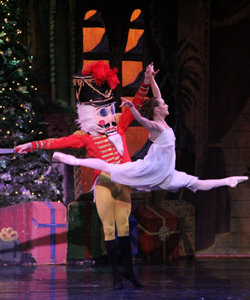 Feel the magic of the holidays at a performance of City Ballet of San Diego's award-winning production of The Nutcracker. As you come into the grand lobby of the historic Spreckels Theater, you will be charmed by a chorus of carolers bringing you the joyful songs of the season. Voted San Diego's Best Nutcracker production by the "Tommy Awards", this elaborate and elegant production, with exquisite costumes and scenery, will take you on Clara's magical journey from her fun filled family Christmas party where toy soldiers and mice become life sized, to the enchanted Snow Forest and on to the Land of Sweets where she is welcomed by the Sugar Plum Fairy, her Cavalier and magical performances from dancers throughout the world. Accompanied by the City Ballet Orchestra and Chorus, this heart-warming production is the perfect way for families to immerse themselves in the holiday spirit, year after year. Following each matinee performances, members of the cast will be in the lobby to greet audience members and pose for photos.